Waveform capnography is an additional vital sign that can influence treatment and transport decisions. Capnography measures end-tidal CO2 (ETCO2), which is the amount of CO2 present in exhaled air. It also displays a waveform that represents air movement during the respiratory cycle. ETCO2 is normally 35-45 mm HG and the waveform is normally rectangular in shape. The waveform provides breath-to-breath feedback about the patient’s respiratory rate, ventilation, and perfusion. Nebulized albuterol, CPAP, and EpiPens are treatment options available to BLS providers to treat asthma attacks. Measuring ETCO2 with nasal prongs can aid the EMT in diagnosing bronchospasm, determining the severity of the attack, and assessing how well the patient responds to treatment. Decreased air movement from bronchospasm causes a buildup of CO2, which makes capnography a better tool than pulse-oximetry to assess asthma patients. A patient’s pulse-ox reading may be normal during an attack, even as they tire from using accessory muscles to breathe. Bronchoconstriction also causes the rectangular-shaped capnography waveform to have a “shark fin” appearance. A rectangular waveform indicates that difficulty breathing is from another cause that will not be helped by albuterol. The more pronounced the shark fin and the higher the ETCO2, the greater the risk of respiratory failure and arrest is. If the shark-fin waveform becomes rectangular and the ETCO2 decreases after treatment with albuterol, we know that the patient is improving. If ETCO2 and shark fin do not improve, some BLS protocols include application of CPAP or administration of an EpiPen. A patient whose ETCO2 continues to climb despite treatment is progressing to respiratory failure, so prepare to assist ventilation with a bag valve mask. A panic attack that causes hyperventilation can be difficult to distinguish from an asthma attack. Patients often appear to be in severe distress with rapid and shallow breathing, breath sounds may be diminished, and transmitted sounds from the throat may sound like wheezing. This is especially challenging in patients with a history of asthma who used a breathing treatment before calling 911. Since anxiety is a side effect of albuterol, it should not be given unless the distress is caused by bronchospasm. Capnography can help make this determination. Hyperventilating patients will have a rectangular – normal appearing – capnography waveform, not the shark-fin appearance seen with asthma. No shark fin means no bronchospasm, which means no albuterol is indicated. Hyperventilating patients will have a low ETCO2, and there are a number of causes for this. Panic attacks are a benign one, where symptoms are caused by “blowing off” too much CO2. In previously healthy patients, who have a history of panic attacks or experienced a stressful event before the episode, capnography can be used as a guide for coaching them to slow their breathing. ETCO2 should increase as their respiratory rate decreases and their symptoms should improve. A number of life-threatening conditions also cause hyperventilation with low ETCO2. These include sepsis, pulmonary embolism, and diabetic ketoacidosis. Capnography must be utilized along with other assessment findings, and all hyperventilating patients should be encouraged to accept transport to the hospital for evaluation. EMTs must often determine when an injured patient should be transported to the nearest community hospital or a level I or II trauma center, if a helicopter is needed, or if the patient requires a trauma team activation. These decisions impact the patient’s hospital course and cost of care, as well as the availability of EMS and hospital resources. 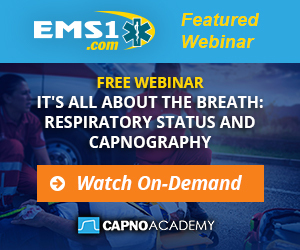 When incorporated with injury patterns, vital signs, and physical exam findings, capnography provides valuable assessment data that can help with transport decisions. Consider a patient who is involved in a motor vehicle crash: his vehicle has moderate damage, he is alert and complains of pain across his lower abdomen in the area of his seat belt. We know that an elevated pulse and respiratory rate are an early sign of shock, but those signs are also a normal stress response. We also know that hypotension is a late sign of shock, and that perfusion to vital organs is compromised before that occurs. Capnography is an additional tool that assesses perfusion status. ETCO2 depends on adequate ventilation and adequate blood supply to the lungs. Low ETCO2 (below 35 mm HG), with injury patterns and physical exam findings that suggest internal bleeding, indicate that the lungs are not adequately perfused. Inadequate perfusion to the lungs means that perfusion to other vital organs is also inadequate. A trauma patient with low ETCO2 is in shock and needs transport to a trauma center. A normal ETCO2 means that the patient is adequately perfused, and that a community hospital may be appropriate. Capnography can also be used to monitor for trends in case this changes. Overdoses on medications for pain, anxiety, muscle spasms, seizures, and insomnia, as well as some illicit drugs and alcohol, can cause altered mental status and respiratory depression. Some altered patients require periodic tactile stimulation to breathe on their own, or assisted ventilation with a bag-valve mask. Waveform capnography is an objective assessment tool to help determine when this stimulation is needed. Hypoventilation causes an increase in ETCO2. Altered patients whose ETCO2 is high (above 45 mm HG), are not breathing fast or deep enough. Often the decrease in respiratory rate can be seen with the waveform as the ETCO2 climbs and quickly corrected after the patient is stimulated. Ventilation with a bag-valve mask is needed if the patient does not respond, and naloxone may also be indicated for suspected opiate overdoses. Altered patients whose ETCO2 is normal have a patent airway, are breathing adequately, and do not require assisted ventilation or naloxone. Capnography can be used to monitor for changes in ventilation while the patient remains somnolent (sleepy). Waveform capnography provides feedback on the effectiveness of chest compressions, accurate placement of an advanced airway like a supraglottic device or endotracheal tube, and a return of spontaneous circulation. Because ETCO2 depends on blood flow to the lungs, it correlates with the quality of chest compressions. ETCO2 can be measured by placing an adaptor between the bag-valve device and mask or between the bag-valve device and advanced airway, like a supraglottic or endotracheal tube. ETCO2 can also be measured by placing nasal prongs underneath the bag-valve mask. ETCO2 should be at least 10 mm HG, and the compressor should be encouraged to get it as high as possible by pushing at the recommended rate and depth. It is also time to change compressors if the ETCO2 drops. Many BLS services use supraglottic airway devices, and waveform capnography is the most reliable method of determining if they are placed correctly. No waveform with compressions means that the device is not directing air into the lungs, and that troubleshooting is needed. The feedback on respiratory rate with ETCO2 also provides a safeguard against hyperventilating patients, which decreases the effectiveness of chest compressions and circulation to the brain. A sudden spike in ETCO2 is often the first sign that circulation is restored, even before a pulse can be palpated. If a patient maintains a waveform and ETCO2 reading with ventilation, but no compressions, their heart is beating. Waveform capnography provides real-time feedback on ventilation and perfusion status, both in patients breathing on their own and patients receiving positive pressure ventilation. This valuable information can be applied to a number of treatment decisions and improve patient care. 1. Wales, R.A., Dycott, W. Analysis of the Efficacy of Waveform Capnography monitoring using Bag-Valve-Mask Ventilation. Previous article EMS1 Poll Results: How do you use capnography?